Urgent action is needed to tackle high rates of heart disease and diabetes among British Asians, say campaigners. UK Asians are about 50% more likely to develop coronary heart disease than people of European origin, British Heart Foundation research suggests. One in five has also been diagnosed with type 2 diabetes, compared with 3% of the general population. The BHF blames unhealthy lifestyles of Asians in the West, urging healthcare efforts to identify those at risk. Campaigners launched their call for more concerted action at the House of Commons last week, on the same day the BHF study was published emphasising the importance of identifying and treating those at risk as quickly as possible. Lead author Professor Paul Durrington, from the University of Manchester, said: "Of immediate concern are the high rates of untreated diabetes, abnormal cholesterol levels and high blood pressure amongst South East Asians in the UK. "The good news is that the final outcomes of cardiovascular disease, such as heart attack and stroke, could be reduced significantly by identifying and addressing risk factors earlier on." 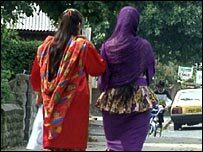 The BHF research reports that South Asian men and women are more likely than the general population to carry excess weight around the waist - a leading risk factor for heart disease and type 2 diabetes. Professor Sudhesh Kumar, of the University of Warwick, said recent studies had shown that waist measurement could provide an accurate way to assess cardiovascular risk. "If you are an Asian woman and have a waist circumference of more than 80cm or a man with a waist circumference of 90cm you are at greater risk of heart disease and diabetes and should seek advice from a healthcare professional. "Healthcare professionals should be aware of the lower risk thresholds for their South Asian patients." A pilot project in South Warwickshire has already been working with local Asian communities to encourage healthier lifestyles. The organisers, who include the University of Warwick and South Warwickshire Primary Care Trust, have developed a DVD for healthcare professionals and South Asian communities. It shows how small changes to diet and lifestyle can have a big impact on cardiovascular health. Zoe Harrison, of the charity Diabetes UK, said: "Diabetes can lead to devastating health problems, including heart disease and stroke. "As people from the South Asian communities are up to six times more likely to develop type 2 diabetes than the white population, we welcome any initiative which can help raise awareness among the Asian communities and curb the current epidemic." The DVD is available for healthcare professionals on 01737 815361. Heart disease and stroke. The facts.